The Pimsleur® Method: the easiest, fastest way to learn a new language. Completely portable, easily downloadable, and lots of fun. You’ll be speaking and understanding in no time flat! Japanese Phase 1, Units 1-5 build on material taught in prior units. Each lesson provides 30 minutes of spoken language practice, with an introductory conversation, and new vocabulary and structures. Detailed instructions enable you to understand and participate in the conversation. 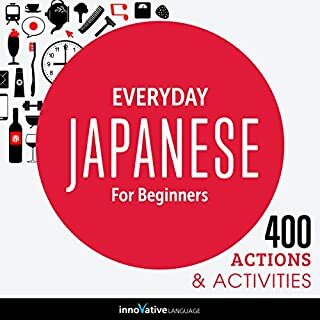 Each lesson contains practice for vocabulary introduced in previous lessons. The emphasis is on pronunciation and comprehension, and on learning to speak Japanese. This system is great as listening and speaking practice for those who only need some basics for tourism. The work is well presented, it's fun to follow and quite challenging in good way. I missed having written materials, and real explanations of the grammar. My fear is that without those you end up like a parrot, able to repeat things, but without much ability to create your own much past what you have been repeating. Also completely unable to read anything. The method presents itself that way, and it does what its system suggests very well. I gave it a 4 because, though I don't believe it should be your only resource if you really want to learn the language, it most certainly is an incredibly helpful one. 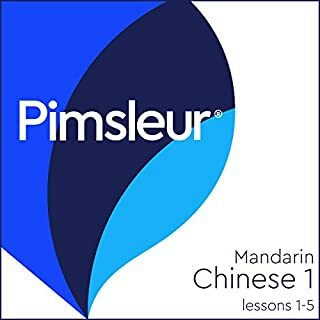 I've failed French twice in college, struggled through two terms of Chinese--somehow learning to write it better than speak it. When I speak Chinese Mandarin speakers tell me they don't speak Cantonese; Cantonese speakers the reverse. I've studied and taught ESL. So I have a lot of experience, and pain. Pimsleur Japanese is amazing. I've learned so much in a week. I still hesitate a bit (I'm on Units 6-10), but when it comes out it's fluid, quick, my pronunciation is good. It's like being a child in the language-when I learn something, I don't recall it--it is just there, like my native language. Being able to use one credit for five lessons is very smart. Try it out. I can't comment on other languages, but the method is sound, so they should also be good. This is probably a secret weapon for taking a second language in school. I usually concentrate on the lesson, while getting ready in the morning, driving to and from work. If my attention lags, or I'm distracted, I'll stop. Always I go back and re-do lessons. I was just in Japan, I watch Japanese movies and I'm amazed at how much more I understand. Very easy to follow and understand. Bought the next three audio books. Highly recommended. just trying to learn japanese while I work. the book is effective but I feel like it's expensive for what it covers. too short, but very easy to learn and get excited about progress. the structure allows a lot of feedback and measures progress. I'm actually learning! It's easy and useful. My sister (japanese speaker living in Japan) is amazed about my quick learning of the conversational basics. Now, the next pack of lessons! Enjoyed every moment. 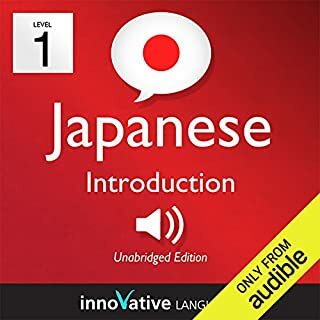 Most certainly increased my ability to speak japanese, I will continue on to book 2.
really helped me to keep the words in my head and feel confident making and speaking sentences. Effective way of learning from audio. Very short so low value for money which supprises me and makes me regret invest in so many units. I’ve followed this course before but only the first dozen or so units. It’s simple to follow and understand. All I want to know at this stage is to speak some basic Japanese for personal entertainment and this is perfect for me. I listen to a new lesson at night then repeat it in the morning. I’m generally surprised by how much I actually absorb this way. The lessons frequently repeat and return to what you’ve learned before reenforcing this while teaching you new things which, for me, has proven to be incredibly effective. My only issue is, and I’ve seen others say this, the guy and the girl pronounce things differently. He tends to end certain words ‘em’ where as she sounds like she is saying ‘en’. From what I’ve seen I think her’s is slightly better but, I’m pretty certain most people will understand you no matter what you say. Great for phonetic training both for pronunciation and the ears. Helped me reduce my accent. The best method I've found. The constante repetition helps alot. Looking forward to the Next lessons. this introductory series is too short and not overly helpful. They fail to explain any reasons behind the grammar or word order of Japanese. they just say a sentence then repeat it in Japanese. it's awful. The Michel Thomas method is much much better in my opinion as they take the time to explain the language. What made the experience of listening to Japanese Phase 1, Unit 01-05 the most enjoyable? The learning format is very good. It flows from chapter to chapter at a well suited speed adding phrases or new words that build on previous chapters. Listening daily is recommended - great for trips to and from work!